5a today. We are operating or functioning or working in a usual way. In our house, that means finding the right tool for the job. We all know the usual tools for moving: clean, dry boxes, bubble wrap, newspapers, packing tape, and sharpie pens to label the boxes. Don’t forget take-out food for dinner and a good bottle of wine for the end of a backbreaking packing day. Another useful tool that I can’t photograph for you: appropriate music for packing. While Patsy Cline and “Walkin’ After Midnight” is effective when you’re mopping a floor, something louder and inspiring is best for packing. Begin with The Rolling Stones and “Start Me Up,” and continue with whatever else you have that won’t annoy your packing partner. An un-annoyed packing partner is perhaps the best Moving tool of all. But this year, Husband found something astounding at Home Depot that has changed our Packing lives and will certainly improve our Unpacking lives: Stretch Film. It is not tape. It is stretchy, clingy cellophane on a wand that you use to bind items together. Unlike tape, it will not rip the finish off of the item when you try to unpack it. 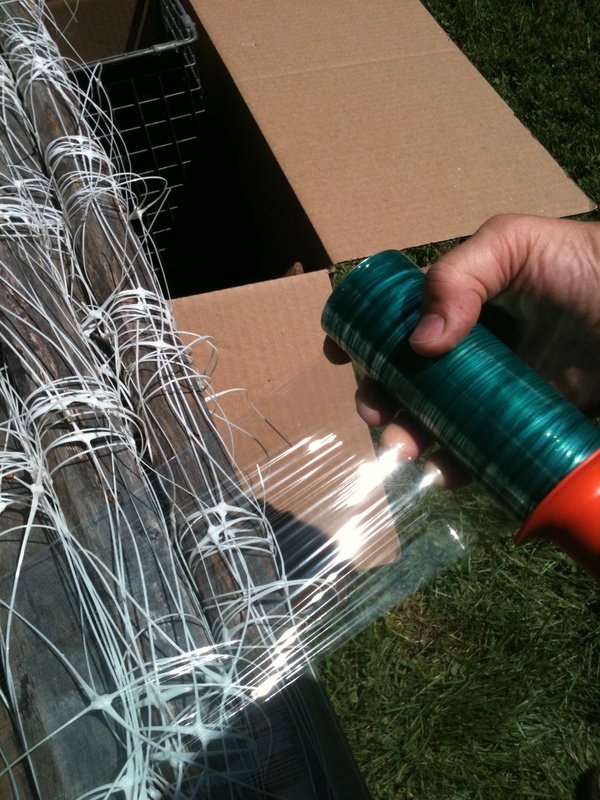 Just like plastic wrap, it will tangle and cling if you aren’t careful when unrolling it. Husband uses it to bind things that aren’t going into boxes. This weekend, we used it to bind my garden tools: Styrofoam pots, garden stakes, and my trellis rods that have the polypropylene netting attached. This last is particularly annoying (“annoying” is a key vocabulary word for Moving), as it sticks out, tangles, unravels, and generally misbehaves. 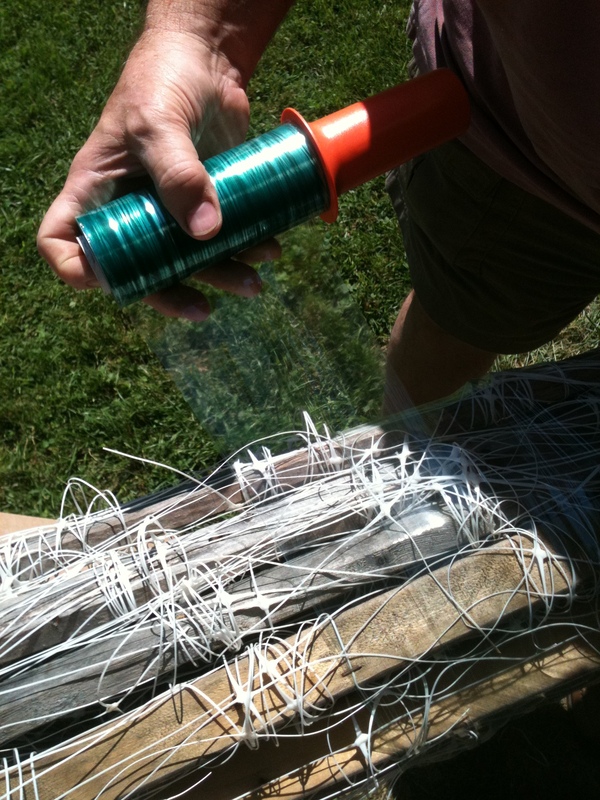 The Stretch Film subdued the netting. I look forward to a zippy unpacking experience up in Maine when I am happily building my new garden. 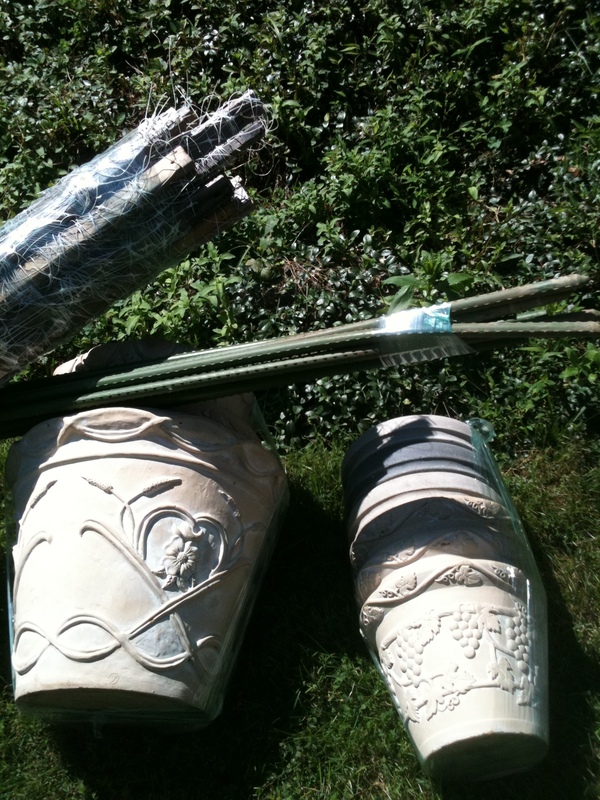 Pots, garden stakes, and trellis poles, wrapped and subdued. I highly recommend this stuff. It works, it’s easy to use, it reduces annoyance both pre- and post-Move, and Husband feels clever for having discovered it. Win, win, win. Yes, all true, but would be better if the roller the film is on actually rolled! I agree completely! I’m sensing a million-dollar idea here…. Husband agrees with you 100%! !